We’ve all done it. At the end of a busy week, your to-do list hasn’t got much shorter and you STILL need to some finishing touches to that Facebook post… Fast forward to Monday and you look realise your well-written blog on social inclusion is accompanied by a pants pic of some plastic-looking, underfed models. Oops. 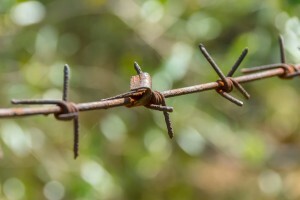 FreeImages.com – High quality free images with an option for a premium account. There’s a huge degree of choice, with a wide variety of cartoon and photography categories. Creative Commons – Licenses image, video, music and more in a variety of ways. It’s a portal to other sites like Flickr and clearly explains how you should and shouldn’t use each image. It can be a bit clunky to use though, the other sources in this list use the Creative Commons license. Jay Mantri – Stunning photos shared by graphic designer and photographer Jay Mantri. He shoots with an eye for design, intending his shots to be used for design projects. Negative Space – All images are CCo licensed, with no copyright restrictions. New images are added weekly so you should go back for a fresh look every couple months. Epicantus – Daria Nepriakhina shares CCo high resolution images on her tumblr. These are perfect for landing pages, blog posts, or designs. Cupcake – Photographer Jonas Nilsson Lee offers free images to the public domain with Creative Commons licensing. 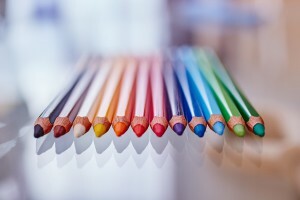 Stock Up – Does most of the hard work for you as it searches about 30 websites for free stock photos. Their stock is 5x larger than most other free image sites. Life of Pix – All pictures are free to use, under a mention CCo license. Leeroy advertising agency and its photographers provide these high resolution images. In sum, Creative Commons will let you search through its main site, and will have more of a range of images available than most other image stocks. There’s a broader representation of different ethnicities and realistic scenes of people with disabilities than the others too. Tip: If doubt of the image licensing, don’t use it. And it’s good practice to check the licensing of any images used for key projects. Digital Exclusion: Is the 3rd Sector Missing the Bus? We are now a mere four years away from the Scottish Government’s bold ambition to make us a world-leading digital nation. The 2020 target in The Scottish Government’s ‘Digital Future’ strategy outlines four key strands: connectivity, digital public services, digital economy and digital participation. The Third Sector should be at the very forefront of this agenda, ensuring digital brings about a positive, inclusive transformation of this small country. To make that happen there’s some critical areas we need to focus on immediately. Various case studies discuss some of these issues. 30% of Scots don’t have basic digital skills. That figure rises to 50% of people with disabilities and 60% where the individual has no qualifications. 15% of Scots have never used the internet. A Citizen’s Advice Scotland survey found 36% of their clients have never been online. These stark figures highlight a massive societal gap that needs to be addressed if we are to achieve that 2020 vision of a digital Scotland. Access to physical technology and connectivity, particularly in rural areas, are important. But for me they’re not the big issues. We need to ensure people have the basic skills needed to get online and embrace the internet. That word ‘embrace’ is key. Oxford University looked at why people choose not to use the internet in their everyday lives – 82% of respondents were ‘not interested’. Researchers found no evidence that these people are restricted from going online. They simply don’t care. For many older, disabled and unemployed people their first foray into the digital world will be mandatory online-only benefits claim forms – hardly an inspiring start. In a sense digital inclusion is more about social barriers than technological ones. Let’s make sure Third Sector staff working with the most socially excluded groups can not only pass on basic digital skills but that they can enthuse them and make them feel the Internet is for them. 30% of Scots don’t have basic digital skills. That figure rises to 50% of people with disabilities and 60% where the individual has no qualifications. 15% of Scots have never used the internet. 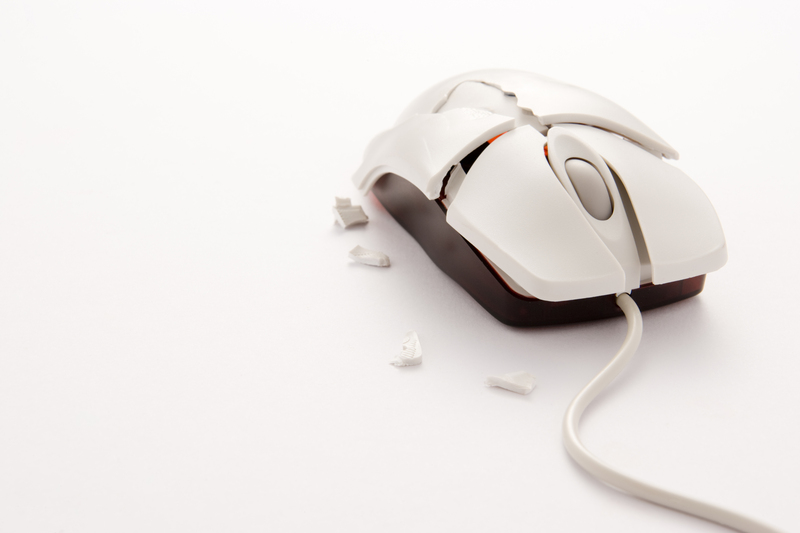 A Citizen’s Advice Scotland survey found 36% of their clients have never been online. These stark figures highlight a massive societal gap that needs to be addressed if we are to achieve that 2020 vision of a digital Scotland. Access to physical technology and connectivity, particularly in rural areas, are important. But for me they’re not the big issues. We need to ensure people have the basic skills needed to get online and embrace the internet. That word ‘embrace’ is key. Oxford University looked at why people choose not to use the internet in their everyday lives – 82% of respondents were ‘not interested’. Researchers found no evidence that these people are restricted from going online. They simply don’t care. For many older, disabled and unemployed people their first foray into the digital world will be mandatory online-only benefits claim forms – hardly an inspiring start. In a sense digital inclusion is more about social barriers than technological ones. Let’s make sure Third Sector staff working with the most socially excluded groups can not only pass on basic digital skills but that they can enthuse them and make them feel the Internet is for them. A key strand of the Scottish Government’s digital strategy is the digital delivery of public services. We need to make sure this isn’t a space wholly controlled by the public sector. The third sector can deliver innovative, effective services through a ‘digital-first’ approach. Of course we will always need face-to-face interaction with service users but let’s not use digital exclusion as an excuse for inaction. Could a Highlands and Islands counselling service save money and reach hundreds more isolated individuals if it allocated half its travel budget to video technology rather than the environmentally-unfriendly, time consuming practice of counsellors driving all over the region? While digital has an obvious cost saving advantage, let’s ensure this isn’t a race to the bottom. Digital should be about changing the status quo, not about leaving the most vulnerable in society even more isolated for the sake of saving a few pounds. Scotland’s billion dollar tech club of ‘Unicorns’ now has two members (Skyscanner and FanDuel) – the technology industry in this country is thriving and the Third Sector needs to start cosying up. As we explore how we’ll tackle society’s ever changing challenges, such as an aging population and growing social inequality, we cannot avoid the huge role digital has to play as a social leveller. We need to work closely with these tech giants and the smaller firms dotted across Scotland – imagine the positive change we could deliver if a tech expert sat on the board of every Scottish charity. Amazon’s UK tax bill to one side, 1% of the tech sector’s profits could bring about huge societal change if it was donated to good causes. It’s great that there’s funding out there for digital inclusion programmes but this should be seen as a baby step. We need funders to understand the difference digital can make and put their money where their mouth is. In the future we shouldn’t need dedicated funding streams – digital should permeate all areas of the funding landscape. We also need to ensure grants officers have the skillset to objectively assess tech-based project applications from charities and social enterprises. This will be key to ensuring Scotland’s Third Sector can future proof the services it currently delivers. Half of all Scottish charities, around 20,000 organisations, lack basic digital skills. This is a massive issue which Third Sector leaders need to get to grips with sooner rather than later if the sector is to be instrumental in delivering that 2020 vision. However, staffing levels are already at an all time low, funding has been slashed for many charities, organisational culture doesn’t always value digital and access to training is patchy. We need leaders who understand this complex mix of issues and what needs to be done to bring about change. I am working with SCVO’s One Digital team to bring together a group of senior Third Sector leaders who are keen to tackle this issue. Look to CEOs like Ian Welsh at The Alliance and Louise MacDonald at Young Scot and we can see there’s charity leaders out there who get digital – let’s make sure we don’t leave half of the sector behind. What do you see as the big digital inclusion issues within Scotland? How can the third sector ensure we make Scotland a world-leading digital nation? Ask any of the young people your charity works with right now to name the social media channel they use most often. I can pretty much guarantee the answer will be Snapchat. Snapchat’s user base has grown by 56% in the last year, with over 400 million snaps sent every day. If you’re a non-profit looking to connect with teenagers and young people this is the social media platform you need to get your head around. In this blog I’ve looked at seven organisations using Snapchat for fundraising, campaigning and volunteer recruitment. How could your charity use it? Working with Penny Appeal, World Champion Boxer Amir Khan welcomed Syrian refugees as they landed on the Greek island of Lesbos. His Snapchat story that day featured raw video of refugees landing on the beach with their makeshift rafts. Amir spoke directly to some of the refugees about their experiences and their journey. Those videos struck a chord with the thousands of young people following Amir on Snapchat – helping them understand the reality refugees face and giving them an opportunity to help. Alasdair Luke, Stakeholder Engagement Officer at Young Enterprise NI. Young Enterprise NI use Snapchat as way to engage young people, providing them with bite-size business tips and advice. The charity have found that engagement levels are high, with over 70% of young people opening the snaps they send. 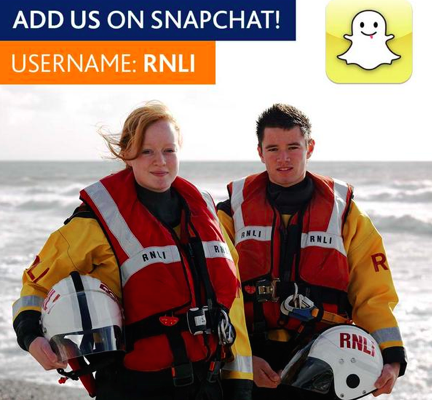 The RNLI has organised competitions, shared coastal safety advice and told stories of their volunteer lifeboat crew on Snapchat. RNLI know that Snapchat will only continue to grow in importance as a way of recruiting younger volunteers. Snapchat is used by the non-profit as a key volunteer recruitment tool and as a hassle-free way of bringing their events to life. Brazilian environmental NGO, OndAzul harnessed the fleeting nature of Snapchat as part of a very effective campaign. They shared 10 second Nature Snapfacts with their followers. Teens who opened their Snap would catch a fleeting glimpse of natural beauty being destroyed by man made hazards. Their campaign on the delicate health of the planet is a great example of what is possible with a bigger budget. 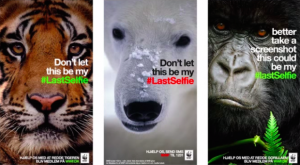 The Danish branch of WWF used Snapchat to emphasise the speed at which endangered species disappear. Each ad featured one of five endangered animals with the tagline ‘Don’t let this be my #LastSelfie’. The campaign exploits the popularity of the selfie in popular culture, particularly for younger demographics. Users were encouraged to snap and send the picture to their friends, a sober image to raise awareness of the issue. For a non-profit whose core audience is young adults aged 13-25, Snapchat was a no-brainer. Colleen Wormsley and Bryce Mathias, DoSomething.org, interviewed by Dasha Battelle for Mashable. 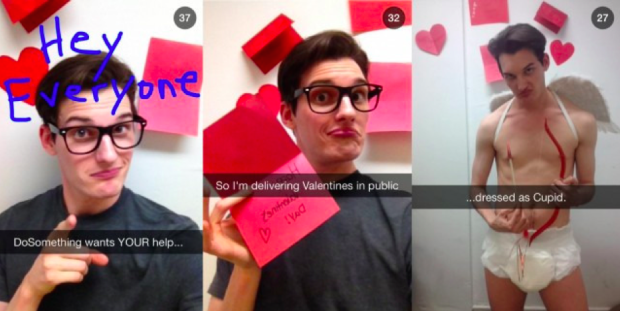 Is your charity experimenting with Snapchat right now? Are you struggling to get your head around a platform that’s become the number one choice for young people? Leave me a comment below or drop me a tweet. This is a repost. Originally posted on JustGiving.